This may sound a little silly, but I’m a fan of Christmas in July. Though we don’t actually celebrate Christmas in our family, I do love the holiday season. Any excuse for a taste of the holidays — even if it’s half way through the year — makes me smile a little. So what does an enchilada pie have to do with the holidays? Let me explain. Every year, we host an annual New Year’s party bacchanal up in the mountains, lasting for a week or so. Most meals are communal, and inevitably we end up making this enchilada casserole one of the nights. It’s a simple, inexpensive, and foolproof crowd-pleaser that scales up very easily to feed forty hungry party animals (quadruple the recipe, use larger pans!). This recipe has become such a staple at the party that each time we make it at other times during the year, I think of the holidays. Having made one of these casseroles the other day, I started dreaming about snow, home-brewed beer, my best friends, a roaring fireplace, and a rousing game of sloshball (not necessarily in that order). To me, that’s Christmas — even if it’s actually ninety degrees and sunny outside today. I tip my hat to my friend Dan, who shared his recipe with us many years ago. I’ve adapted it and tweaked it over the years, and really, it’s a little different every time, since we use much of whatever we’ve got on hand. It’s easily adaptable to specialized diets, too. Already vegetarian (adding meat is so not necessary — it’s hearty enough! ), we usually make one “regular” version and one vegan version (just skip the cheese), and most people have trouble deciding which they like more. If you use corn tortillas, it’s gluten-free, too. A couple of years ago, I started using 100% whole wheat tortillas instead of regular flour tortillas, and people didn’t even notice. This healthy recipe is a great example of the My Plate guidelines (even if it’s not divided into separate compartments). It’s about 1/4 grains (tortillas), 1/4 protein (beans), 1/4 vegetables (spinach, mushrooms, peppers, onions), and 1/4 fruit (tomatoes, avocado) — with a bit of dairy (cheese) on top. But I haven’t even mentioned the best part yet. Christmas Day Leftovers! 10-12 corn or 100% whole wheat tortillas read ingredients carefully; look for tortillas with short ingredient lists! Heat the oil in a large saucepan over medium heat. Saute the diced onion for 3-4 minutes, until it starts to soften. Reduce heat to medium-low, and add the enchilada sauce, black beans, and refried beans to the saucepan. Stir slowly until mixed thoroughly. Add any "extra goodies" to the sauce and continue heating and stirring until it starts to simmer. Be sure to stir continuously, else it may start to splatter as it comes to a boil. The goal is not necessarily to cook the veggies and sauce, rather to be sure it's evenly mixed and hot. If using fresh spinach, you'll want the leaves to be wilted/softened, so they don't take up too much space. 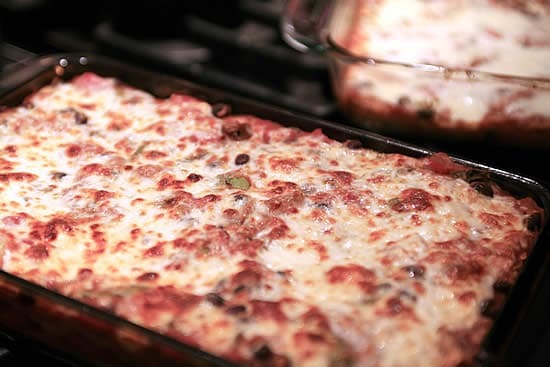 Once everything is mixed well, turn off heat and start layering the casserole in a lightly greased 9x13 baking pan. First, add thin layer of the sauce to the bottom (if you start with tortillas first, they may burn). 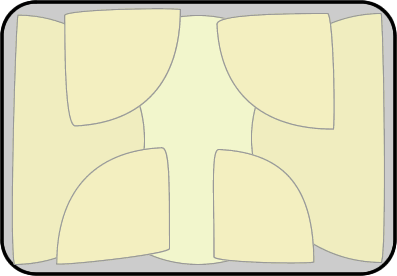 Add a layer of tortillas (see diagram, below). Then alternate sauce and tortillas until there's about 1/4" of space left (or you run out of sauce or tortillas! ), ending with a layer of sauce on top. Be sure all the tortillas are covered by sauce; any tortilla that's not covered will dry out. Sprinkle the cheese on top, and cover with aluminum foil. "Tent" the foil so it's not resting on the cheese (this makes it easier to remove later). Bake at 350°F for 40 minutes. (If doubling the recipe, or using a deeper pan, you may want to bake a little longer). Remove foil, and bake for another 10 minutes, until cheese begins to brown. Allow to cool for at least ten minutes before serving. Tear tortillas in halves or quarters as necessary to create a single layer. I usually start with one whole tortilla in the middle, and then tear another in half to create flat edges, which go on the outside of the pan. I may tear a third one in quarters, and use that to fill in the gaps. It's good if they overlap a little. Using canned enchilada sauce speeds things up, but the sodium content is usually frustratingly high. You can also use canned tomato puree or chunks (or fresh diced tomatoes, simmered for a few minutes), with cumin, chile powder, oregano, garlic/garlic powder and any other spices as you see fit. It should be thin; the tortillas will absorb that extra moisture. Think I will hold off for cooler weather but this is a really versatile recipe – love your graphic design! Thanks for sharing!! I must say I love your little cartoony illustrations. I LOVE them!!!! So helpful! I have made something similar and indeed I called it Tex Mex lasagna, but I will try this recipe. I love a mass one-dish meal for 8. Great for weekend guests, etc. I recently did a breakfast casserole (in May?). Give me shout if you ever try it out. Oh and I do love your restaurant evaluations! A great tool for us!!! Oooh. I bet even my husband would eat this. I might switch out summer squash for the potatoes and not tell him.